Will You Save If You FSBO? In most cases, the answer is “no.” In fact, FSBO sales, on average, net 6% less than homes sold by a Realtor®. 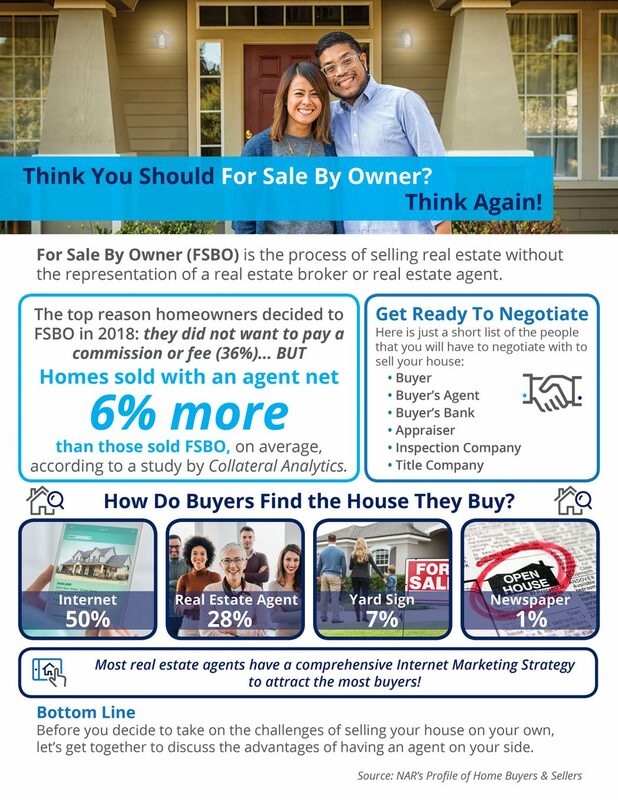 36% of homeowners who decided to FSBO last year did so to avoid paying a commission or fee according to the National Association of Realtors’ Profile of Home Buyers & Sellers, . But, homes sold with an agent net 6% more than those sold as a FSBO according to Collateral Analytics thereby negating any true savings! Professional marketing and Realtor® representation bring far more qualified buyers resulting in higher sales price. Disclosures, deadlines, documents and more! There are many moving parts to selling and closing a home. Access for showings and security are best accomplished with a Realtor®. Before you decide to take on the challenges of selling your house on your own, contact me today for a no-obligation meeting to discuss how I can bring you a higher sales price and better sales experience.